The only reason this cover was not the best of the week was because I knew I would be writing a review of this book. How could I not? It features some of the most classic movie videos of all time and one that mesmerised me when I was a child. Take Me On was a wonderful video where a woman reads a comic strip and is then suddenly offered a hand from within it’s pages and she is transported into a magical world, full of wrench wielding military men. The effects were immaculately done, even then they had you engrossed, with a song that was equally addictive with its long choral melody. This front page instantly took me back to my youth and this adulation probably counts as a great example of phonomancy. 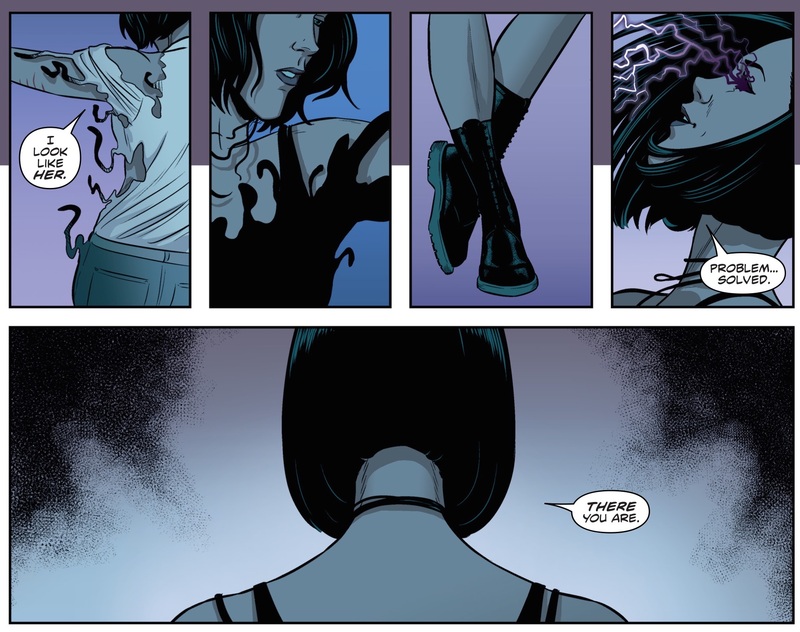 This was my first adventure into a weekly Phonogram book and I thoroughly enjoyed reading the original two as trades. As I was reading I noticed something: I knew almost all of the musical references without consulting the often-compulsory Gillen guide, and it made me very happy. The natural contemplative path for myself as a reviewer, was to consider whether this comic would be enjoyed as much if you didn’t understand the music? Is this an insider’s comic and has it always been one? Did my love for the Manic Street Preachers drive my love of the original Phonogram? Do I have to even explain that particular sentence? A little more introspection was required. The phonomancer is the keystone to this particular run of stories and loosely translates as the use of magic through music. I have always seen it as the euphoria brought about by the love of a particular song, but manifested in a physical being. This concept is fundamental to Gillen and McKelvie’s artistic endeavours as it expresses their love of music and also the foundation on which their careers have been built on. This third volume has been highly anticipated and focuses on Emily, who sold half her soul for phonomancer powers. Unfortunately the half that was forsaken has taken back her body and Emily is now trapped in a television showing only music videos. Her “evil” self is causing trouble and slowly destroying the world she lives in by throwing a party and alienating the established phonomancers. For a Gillen story it is fairly succinct and easy to understand; a simple takeover bid with a lot of music homages. 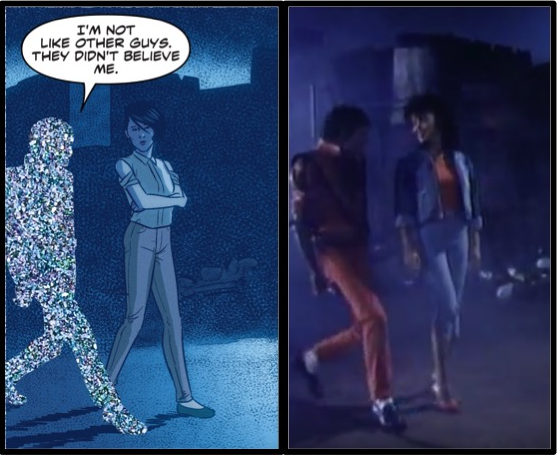 Emily is the central protagonist of this comic with her wronged clone being the nemesis. The narrative is expressed through a rather esoteric monologue but the art is as captivating as the music videos it portrays from all those years ago. McKelvie is very dedicated to this cause and the images shown demonstrate how closely he kept to the original scenes. His attention to detail is fantastic and the delicate alterations bring a terror to the songs. 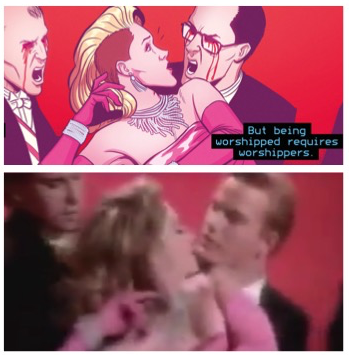 Wilson’s colours are essential to providing the atmosphere of the videos, for example Madonna which has very rich pink and red colour set that is integral to the feel of the song. I am very impressed with McKelvie’s sketch of Morten Harket, the lead singer of Aha. In fact he has produced a wide variety of faces in this book, so much so that Emily’s pointed chin is perpetually surprising to me. The facial expressions are a hallmark of Jamie’s work as with a couple of strokes of the pen, the emotion emanates from the page. The modern day events are draw as simply and identifiably as they were in the previous volumes. I particularly like his use of shadows in Emily’s office and of the glasses on David Kohl’s face. There is so much to enjoy throughout this book.